Cox's Cave is in Cheddar Gorge on the Mendip Hills, in Somerset, England. 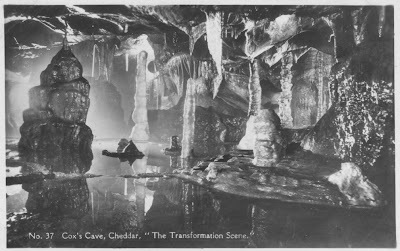 It became a show cave soon after it's discovery in 1837, and is named after the owner George Cox. An opening was cut to allow early vistors access. Further work allowed lots of visitors to visit. Initially the interior was lit by candles, then by gas. By the time of this Frith Postcard it was the wonder of electric lighting gave such unwavering clarity.